Incredible. Easy to use. Perfect color match to my Nissan interior. Could not be happier with the results. At first the color seemed a little off but once it dried it was perfect. Thank you! I bought the Leather & Vinyl Repair Kit to use on the front seats of my 2007 Toyota Avalon. They were really showing their age, especially the drivers seat. I was skeptical about using the product but took the plunge and ordered the kit. What a difference!! They now look like brand new seats. The color match was right on the money. Take your time, follow the instructions and you can't go wrong. Don't worry about streaks when the color flex is still wet! I used 3 coats and when it dried the seats looked great. Can't say enough about the huge difference this product makes. Buy the kit. You won't regret it. I wanted to take the time to say thank you for developing a product that is so easy to apply and the results are simply amazing! My Magic Mender story started about four years ago when I needed to re-color some of the interior on my 2007 Porsche convertible. I bought it used and the dashboard and seats looked faded. Porsche said there was nothing that could be done to revive the interior. Well, they were wrong! I searched and found your website, ordered the color flex from your easy to follow guide. My car looks brand new after applying your product. The color matched perfectly, too. I brought it to the Porsche Dealership and showed them the interior. They were astonished how well it blended in with the rest of the interior. Last month I borrowed my brother's 1999 Benz. Since I had the car for a while, I detailed it and discovered how badly the seats had faded and their dog had put many scratches in the leather. Magic Mender to the rescue, again! The interior looks brand new, and my brother thought I had the seats re-upholstered. He was shocked when I told him about the product and spent $26.00. 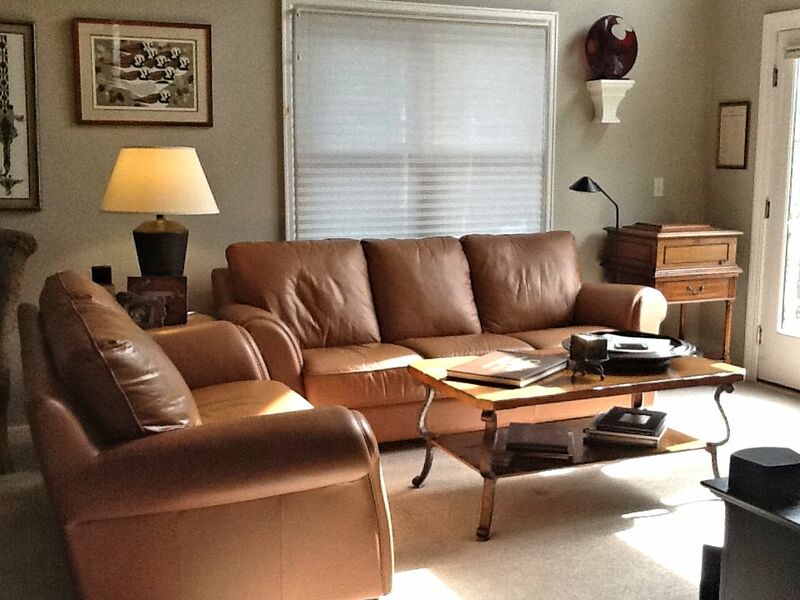 We have three leather Natuzzi brand matching couches in our family room that we purchased 21 years ago. The couches were in great mechanical condition, but with six of us sitting on them for so long, they looked absolutely terrible. We spend approximately $7,000.00 back then for the couches. My wife thought it would be best to replace the couches. I mentioned your product and she was skeptical that it could help them in the condition they were in (many scratches, scuffs and fading). 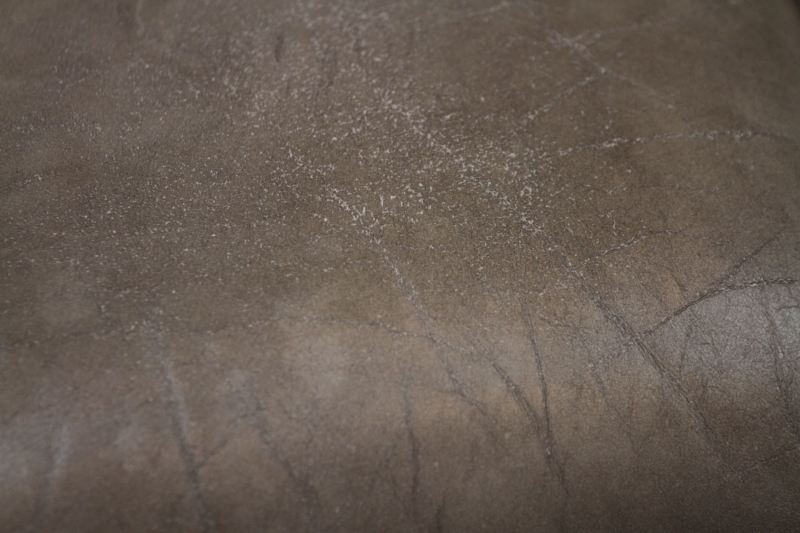 I sent a sample of the leather to Magic Mender and crossed my fingers that they could help. I received an actual call-back and they matched it to the interior color from an older BMW color, who would have thought! After prepping and coloring the seat bottoms and arm rests, our couches look BRAND NEW. The entire process took about eight hours because I applied five coats of the product. As usual, I followed the simply directions and used a hair dryer to speed things up. Thank you for saving me many thousands of dollars in not having to purchase a new set of couches, very thankful. My wife is amazed how new and fresh they look. This project cost us about $140.00. Not a bad return of investment! I think this product is amazing! I had some very bad peeling leather and cracking on a portion of a leather chair that I thought was not going to be possible to repair and still have it look good. I found Magic Mender online and decided to give it a shot. I received my kit and started my repair according to the directions included. After completing the repair, I was amazed at how good it looked even though I initially didn't match the color exactly right. I decided to send away for another color that I thought was more closer to my chair color. The second color I got was a perfect match. I applied it over the first color and it looks fantastic! I never would have thought that it would have come out looking so good. Outside of a few areas that I could have smoothed out better, you can hardly tell that it was repaired, and it looks a LOT better than it did with all the peeling and cracks that were there before the repair. This product is easy to use, dries fast, and it works great! The hardest part in all of this was finding the right matching color. The only suggestion I would make is to offer some sample dyes (grouped by similar colors) to help with finding a good color match. WOW! I’m blown away! You really have to make sure you smooth out the compound to avoid any raised areas, it took me a bit to get it how I loved it and now I can’t stop staring at the change. I have NEVER used a leather repair kit before, in fact I had no idea how to do it until I searched the web. If you’re repairing your car, you may need more than one kit, I’ll need a 2nd for the remainder of my husbands Rover. He’s active Army and doesn’t have the time to work on it like I do being at home more. It’s actually pretty fun to work with it. Enjoy! 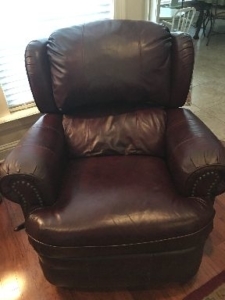 I have a high end recliner, I purchased 20 years ago. I still love it I had it professional touched up and cleaned. Last time I paid $300 for the touch-up. It's been less than a year and I noticed more wear and tear. I thought I might have to replace it. I found you on line and decided to try one last time. I am so very much impressed. I can keep my favorite chair. It looks like new again. Mustang 2005 GT, leather, crimson red; the color match is absolutely perfect. I'm impressed. Skeptical but ordered anyway, turned out the hardest part was to pick the correct color. I read the directions 3x and followed them exactly except applying the first color coat with a sponge and 4 more with an inexpensive spray gun (undiluted mix). Incredible return to function and color that I've (now) use for a month w/o any change. Great product that I'll be confident in using any time I need. They look FANTASTIC. Sorry I don't have a "before" picture. I have 2 young cats and they put claw holes in my leather couch I thought it was ruined. I didn't have the money for a professional to fix it and decided to see if I could do it on my own. After searching a lot of sites I decided to give this one a try and was not disappointed. I never thought I would be able to cover the holes, it took a little work to smooth it out before applying the magic mender but it was well worth it saved this couch. I wanted to take a moment to "Thank You" for your fabulous product! We received it today and although my wife was skeptical, we both agree that our La-Z-Boy recliners (purchased in 2012) now look good as new! The color match was unbelievable, and the touch up was achieved with just one application. Our Guardman policy we purchased with the chairs was useless and cost us $120 per chair. If I were you, I would make a presentation to La-Z-Boy Corporate to have you product included as an option at point of purchase. Granted our chairs are dark and are easier to mask scratches and wear, but it still might provide an opportunity for your excellent product. I would show you what a difference it made, but unfortunately we didn't take any "before" photos. Thanks again, and we will share our experience with friends and family! Purchased your All in One leather repair kit to repair our sofa. It was try to repair it or out with the garbage it would go. To my amazement, your kit made it look like new. Thank you. A visiting friend sat down on our 5 month old leather couch with a pen in his back trouser pocket. Wham! Blue ink all over one of the seat cushions of the couch. I attempted to remove the ink with rubbing alcohol-something I had read on the web. It removed the ink but also discolored the leather. I called in a professional. He wanted $200.00 to $400.00 to re-dye the couch. I went on the web and did a search for "leather repair kits". Your company showed up in the search so I navigated to your site. One of the colors in your color chart looked like a perfect match. I ordered your basic kit and today finished the repair. THE COUCH LOOKS LIKE NEW! I am not kidding. I know your website says that "the repair may look like a repair". But this exceeds all expectations. Thank you. I just wanted to share with you my experience with your product. I have a pair of Natuzzi leather sofa and chair which are 11 years old. The chair and sofa unfortunately had some bad scratch marks in the corners where a cat I once had took to them so badly it took the leather off very badly on the corners of them the sofa's where good but I hated to look at the corners of them and had pretty much decided they are damaged and it's time to replace them because I had tried other products which just made it look worst than they where before I used the product on them. But thanks to your product those two pieces look like brand new! I have never used any sort of fabric or leather repair product which was as easy and actually did exactly what it claims to do! You would think they where new ones or I had some professional do it and paid a big bill for it too. This by far has been one of my best purchases I have ever made! I just wanted to tell you how satisfied I was with the color flex that i had sent to repair my white leather sofa. I followed the instructions, and put on three very light coats, and the repair is virtually invisible. I cannot believe i saved that sofa for a mere $14.95. What a pleasure to find a product that works so well. 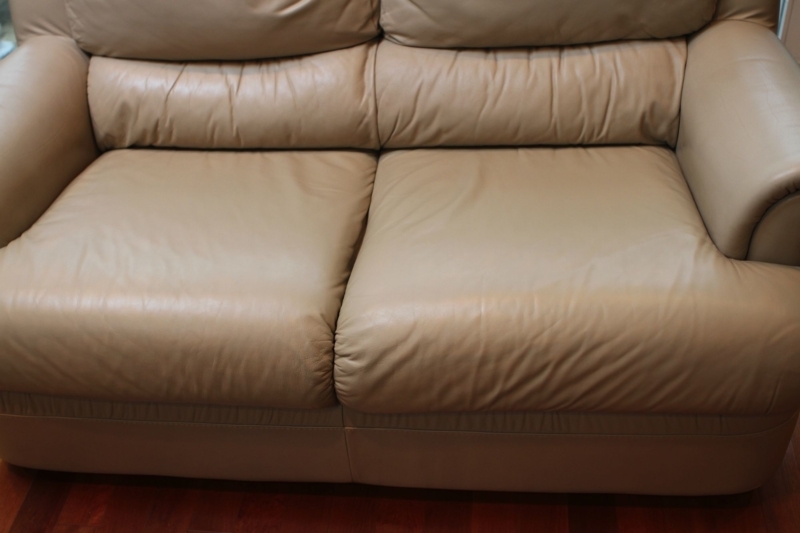 Thanks to your Magic Mender, I was able to save my 14 year old leather sofa. My kitty had literally scratched so many holes in the sides that the threads took me over 2 hours to cut off. I put on the mender, and still saw the gray threads. I thought there was no way it was going to look any better. I applied the paint, and to my amazement, the sofa looked fabulous! You just can't tell there were any repairs made. The color blended well into the existing color. Magic Mender was easy to use and apply. It took me more time to prepare the sofa than it did to use magic mender. I also used the paint to cover over some wear on the sofa. My only regret is that I did not take a before picture to send to you so you could see how damaged my sofa was. Thank you for a great product for a great price. Your instructions on repairing a leather steering wheel are nothing short of amazing! I followed the directions I received from your site to brush on instant krazy glue and use backing soda exactly as you recommended. Then I sanded the repair to a smooth finish . Today I painted on the magic mender colorflex leather and vinyl coating as instructed . : Toyota med oak 456 ( a perfect match by the way) and the results are a near perfect restoration of the steering wheel on my 1993 Toyota Camry. Toyota quoted me $ 800 to replace the steering wheel. I restored it thanks to you for less than $40. It was truly amazing. Thanks for the great instructions and support. Please use this as a customer testimonial. I only wish I had " before" pictures to compare to the final result. If your other products work this well, no wonder you are the leaders in leather repair! I just wanted to tell you how pleased I was with the material I ordered to repair the leather bucket seat in my Chrysler Town & Country. I was frankly skeptical that it would work, but it was easy and worked very well. It's been about 3 months, and still looks great. Thanks! When my husband and I first got married we decided on a black leather couch and arm chair specifically because we had an indoor cat. We figured that it would collect less fur and that when we had a child marks would show up less. To protect ourselves we even bought the expensive protection plan at the furniture store. Well almost five years later we've moved states and our couch looks a lot worse for the wear. We tried to get the furniture protection plan to cover the damage but no one told us that if we couldn't find the original receipt they wouldn't even talk to us! The plan is maintained by a third party company, so even though the store knew we were still covered we couldn't get the other company to deal with us. I thought that all was lost. I resigned myself to the fact that we had bought a $1500 scratching post for the cat. I was embarrassed to have people sit on the sofa. But then I found your product. You can't even see the damage!!! It literally disappeared!!! Thank you!!!! Terrific product! Complete, easy to follow instructions. Great company to do business with. I'm impressed! Very nice product. I refinished the leather seats in my Mustang GT Convertible and they look great! I had some pet damage (scratches and punctures) and normal wear spots & cracking. The color match (Ford Midnight Black) was just right. Materials provided were easy to work with, and I applied many thin coats of Color Flex with a foam brush. I then used the pump sprayer to blend it all together, taking great care to make sure the nozzle was always clean and putting out fine mist. I achieved the best results by applying Color Flex to the entire seating surface...then spraying on the finish coat to hide any streaking or uneven spots. When dry, I gave the seats a bath with Lexol Conditioner. The whole process took me a couple days, but you can not rush this type of project in order to achieve a fine quality finish. Thanks for your help. I used Dap contact cement to glue the new surfaces. A little "liquid nails" around the edges worked great. (I sanded the edges to make them smooth-the liquid nails takes the color-flex just fine). I covered the entire chair in Color-Flex so everything would match. I wouldn't say the chair looks new but am very satisfied with the way it turned out. I had used alcohol to remove a permanent marker spot on our leather sofa and ended up with an area where the dye came off too. After spending a day reading on the internet about leather repair products, I decided to try Magic Mender. The testimonials and photos were helpful in making the decision. I waited a week to attempt the repair. I was worried it would look worse than it was, but as you can see the results were great. The sofa sits under a skylight, so any imperfections blare right out; the results had to be perfect. I've very pleased with your product. 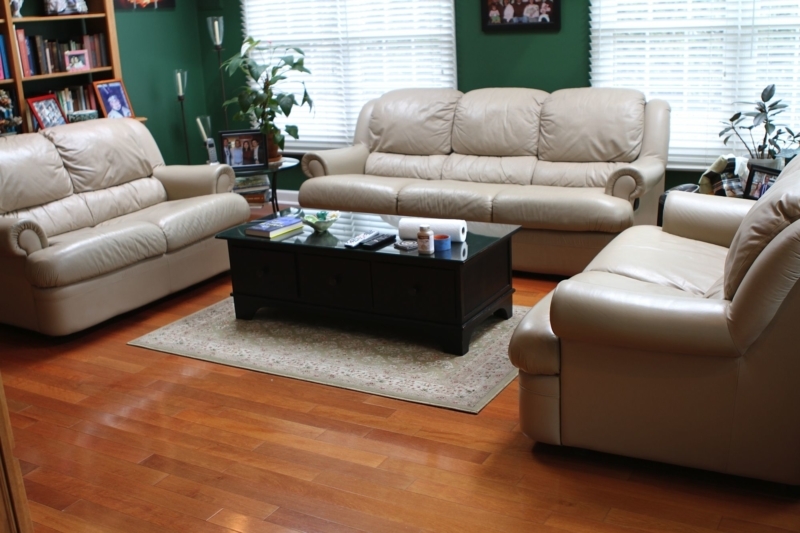 Because of the professional looking results, I don't have to rearrange the living room, just to hide the affected seat. I found that using a thick, cotton sock to blend the product on, in very thin layers, proved to be a good technique. I devoted an hour to blending a small amount on, and waiting 5 min., layer, by layer, as the product label suggested. Thank you - informative website and wonderful product. I searched the internet for the best leather repair kit I could find and decided to try your product. the item I was trying to repair was an expensive motorcycle saddlebag that was damaged after a spill. The bag had heavy damage to the right side and seemed like it might be beyond repair. I found your product fairly easy to use and made 2 repairs to this bag before color-flex matching. The results speak for themselves. Thanks for the awesome product. I will keep using it in the future and I will recommend it to my friends. I cannot believe how awesome the Magic Mender is. My burgundy leather chesterfield had deep groves in it, ( from my two choc. labs who aren't suppose to be on the chesterfield, but if I am not in the room they think it is theirs). I was at my wits end, The chesterfield and loveseat are still in great condition but the groves and wear and tear just stood out like a sore thumb. It was the only thing I could see when I walked into the living room. I had tried other products, that would fade the marks but they would be back in days. I ordered Magic Mender, had the product in 2 days, the kit looked so simple I thought I had just wasted $60.00, But WOW, it worked. It is absolutely amazing. The seat cushions look brand new. It is so simple to do. The instructions are very simple and easy to follow and the results are incredible. My family has asked me to stop showing them the repairs, and I am no longer allowed to bring in strangers off the street and show them how great the Magic Mender worked. Everything with my experience with this company has been outstanding, from choosing the colour, ordering, details on shipping and the product itself. Wow! I have a beautiful midnight blue leather furniture set. It is 19 years old, from Italy, I bought it while living over seas. Quality, second to none. I was devastated because it looked like we were going to have to replace. I searched the web for one last effort. I received your product on Monday late afternoon. After work on Tuesday, I did all the cushions, and the arms and any touch ups, AMAZING! My furniture looks brand new! Attached is the ottoman. I cannot thank you enough!! 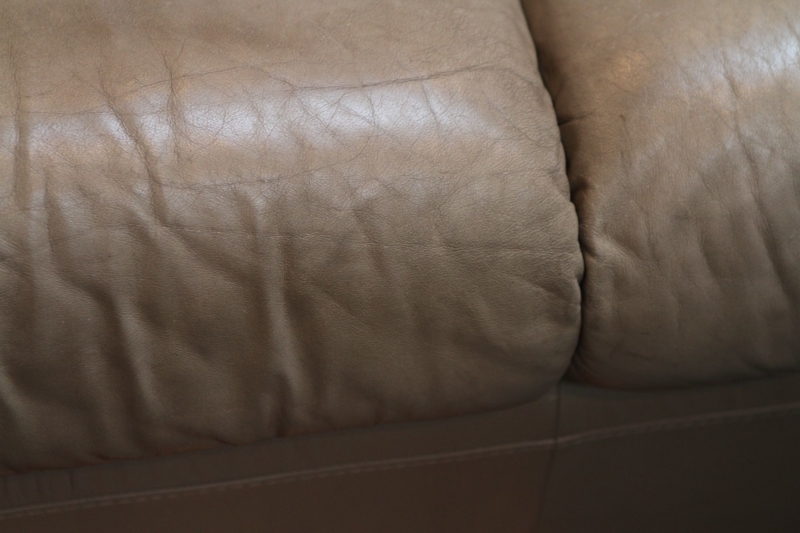 I purchased a used leather couch that had a tear in the corner of one of the cushions. I checked around and found that it would cost anywhere between $150 to $180 to have someone come out and repair it. I googled leather repair and found Magic Mender. After reading the testimonials and viewing some of the before and after images I decided to give it a try. I certainly am glad I did! I found Magic Mender to be easy to use and the results miraculous. Take a look for yourself. Wow! I received my Magic Mender repair kit in less than a week using USPS Priority Mail---great speed since it's hard to imagine another continental destination farther from the West Coast than Estero, Florida (between Ft. Myers and Naples). Your repair compound and Color Flex product is fantastic! I used it on a damaged front seat of my 2004 Honda Accord that I was dreading would require an expensive upholstery job at an auto leather repair shop. The seat looks brand new--you can't tell there ever was a problem. I was very skeptical of your claims and customer testimonials, and almost decided not to order your repair kit thinking it would be a total waste of money. Your products have exceeded my expectations, and the professional looking results are terrific.. I used your product to repair the driver's seat of my 1992 Toyota Celica. Following your directions closely, I found the results to be quite satisfactory; frankly much better than I had anticipated being skeptical by nature. The color match for the leather (dark gray) was perfect. Though I initially thought the kit price to be a bit high, it certainly was much less than recovering the seat. I hope that the repair compound and Color-Flex will remain useable over the next few years as they are kept (well-sealed) in storage, awaiting the next leather repair. Thank you for a fine product that works as advertised. I am writing to tell that I'm very impressed with your product. I used it on my cream leather sofa and it looks like new. It had several large scratches and I can't see them at all now. Previously I had someone from Fibrenew repair the area. It broke down the first time anyone sat on the sofa. That's when I decided to try Magic Mender, which cost me much less. The instructions were very clear and I'm so delighted with the results. This is the Canadian Thanksgiving weekend. Magic Mender is high on my list of things for which to be thankful. I just finished using your product on my worn, cracked, and faded BMW leather seats. I just have to tell you it was an awesome transformation. It took me and my wife about 12hrs to do my whole car including door panel inserts. As you state in your instructions, the key to a good finish is to apply very light coats. I ended up putting about 6-8 coats just to be safe but it's worth the time. The only thing I would change about the process is to mandate sanding if you use the mender putty. I found out through trial & error that you pretty much have to sand the putty if you really want that smooth feel. Another thing that sold me was your extremely prompt support and customer service, I had a question about color, and you responded very fast. The whole site is true to what is stated and that is a really great thing to have. Now comes the true test in seeing how long it will last but I have faith!!! (And just FYI...it took 1 1/2 bottles of the color flex to complete the whole car) Here are some pictures of the seats. Please feel free to use them on your website. After enjoying successful and thoroughly satisfactory results with Magic Mender, I ran out of repair compound. I was in a hurry, so I bought what the staff of an automotive parts house considered its best leather mender. The results were disappointing. I'd assumed there were similar products on a par with yours, but friends have fared no better with other substitutes. I'm now convinced Magic Mender is the gold standard in leather and vinyl repair. I won't settle for less. Hi. I just wanted to say how good this stuff is! A while ago I purchased some ivory #375 for the leather in my Lexus rx300 and it worked great! Last week I noticed some wear on the steering wheel so I figured I'd try it out, but its the dash color. I called the dealer to which they stated the dash color was "sandalwood" but it didn't match any of your references. So I took a guess and bought dark taupe #13. Well it's a PERFECT match! If you want, you should audit the name to "sandalwood" for it seems this is what the dealer tells people. It matches 99-03 Lexus Rx300 and possibly other models? This info might help other customers in the future, just figured I'd tell you! Thanks for making such a great product! FAST shipping too, I couldn't believe it! I will DEFF. be doing business with you again soon! Just wanted to tell you how impressed I am with your product! I just got finished repairing my 1 year old couch that my cat wanted to use as a scratching post, and I'm standing back in astonishment!!! This product is just the best, easy to use, affordable and the end result is just wonderful!! I would recommend this great system to all my friends, family, and anyone who will listen. THANK YOU FOR SAVING MY COUCH!! We recently bought two new leather chairs and were concerned that our 12 year old leather couches might look a little aged. I decided to purchase your repair kit and give the couches a try. I am amazed at the results. Most of our repairs were on the edges of cushions and corners of the frame. The color match was near perfect. I cannot really detect where the repairs were made. I am very pleased with the results and will probably purchase another kit for the chairs for the inevitable nicks and corner wear . I have a 2000 Lexus GS400. I found the Lexus-Dark Taupe #13 was nearly a perfect match for my steering wheel and gear shift knob. Red circles indicate damage. Sorry no before pic of the gear shift knob but trust me, it was worse than the wheel. I used the touch up kit and just painted the whole steering wheel and gear shift knob. I still have 95% of the bottle left. I'll be ordering up some more to do my wife's 2002 GMC Yukon beige seats. We had just bought a new leather sectional. While transporting home, the wedge corner piece got caught on a staple sticking out the back of one of the other pieces. It caused a big tear in one spot and several deep scratches in another. I went online to find someone or something to fix the problem. I found your site, read all the other testimonials and decided to give your repair kit a try. Man, what a great product! With a little patients and your system, it worked a miracle. Now you can't even tell it was ever damaged. Your product works great. Perfect match for our two leather sofas. All I needed to do was re-dye two spots where our heads rested on the high-back area. They had lost their color. I used your sprayer and blotted the area with a cloth. The area is now perfect and cannot be detected at all. Amazing. Good to know we have a bottle of your product available. Perfect product. Looks great. Perfect match on color. I couldn't ask for any better product. I will recommend your product to others. Just wanted to let you know how well Magic Mender Worked. I was really pleased with the results. I would just like to leave you a Testimonial with pictures. I am very happy with your magic mender kit. Did not expect this kind of results! Driver & Passenger Seats - Rubbing from getting in and out of car. Passenger Seat - Big Crack of leather in the middle of the seat. It's being a month since I've done and and it seems to hold up well. I finally got around to using Magic Mender on a cut in the side bolster of my driver's seat (Toyota Highlander). I figured the product would work ok, but it would be evident that things were "patched". To my surprise, the repair isn't evident unless you know exactly where to look. The color I picked (using the color code on the vehicle) matched perfectly. Alas, I forgot to take any pictures. Thanks for a fantastic product!! Just want to share details of another successful project. I have a leather sofa that is structurally sound, but the seating area was becoming quite worn from pet damage and heavy use, with people sleeping on it (cause it's so comfy). I found the best color match within the GM family of automotive interiors. After covering everything except the seating area, I got to work patching and smoothing. Also had a couple of small punctures. All those blotches you see in the photos are the patching material, followed by a couple thin coats of finish. I kept applying thin coats (with Preval sprayer) until I was happy with the finish an the repairs were no longer visible. The key is to apply many thin coats. I think it turned out very nice. A very economical fix!! I do not have before and after photos. No one would believe it anyway. This product is absolutely amazing. 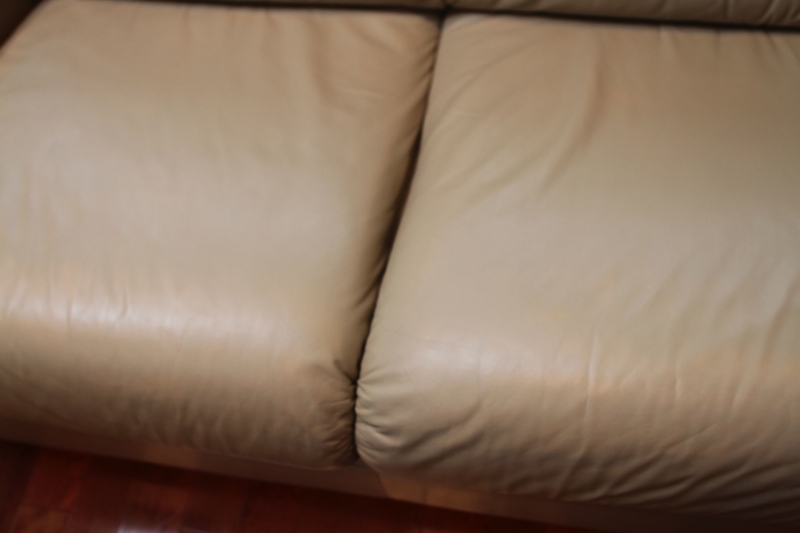 The cushions on our 20 year old Natusi leather couch were terribly worn. We were going to buy new furniture or try to take the leather from a matching chair and reupholster the cushions. I found your product on the Internet and thought I would give it a try. The couch looks brand new. Unbelievable. The color was a perfect match. I do not know how this will wear but it certainly looks fantastic. I own a Chevy SSR and the leather cover on the steering wheel had a gouge in it about the size of a pencil eraser. The quote for replacing the leather on that part of the steering wheel was $250 so I thought that Magic Mender would be worth a try. The results are excellent! One needs a magnifying glass to find the repair. Word to the wise: Much like other good repair processes, don't rush. Allow plenty of drying time during each stage. And, like doing good body and paint work, use the sandpaper sparingly and with a light touch at each point until the desired results are achieved. Magic Mender works. I own a 2000 Volkswagen Beetle with grey leather seats. The driver's side seat had started to unravel along a vertical seam on the side. The split in the seat was about 5 inches long. I had pretty well decided that I was going to have to buy a replacement seat from the salvage yard. I read the ad for Magic Mender though didn't hold out much hope. But, the price was right. I sewed the seam closed, cleaned the seat thoroughly and then applied the filler compound in several coats. I painted the joint several times feathering out the paint. The repair is quite invisible and is holding up well almost a year later. This kit works amazingly well. It produces an durable, undetectable repair even on large areas. Highly recommended! 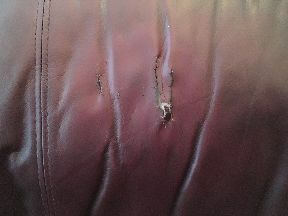 We have a beautiful black leather sofa with one cushion that was cracking and had a small one inch cut in it. We ordered your repair kit and followed the directions. It worked exactly the way you said it would. The cushion is now restored, looks beautiful and matches the others cushions perfectly. Your product is amazing. Thanks for saving our sofa! I just fixed my Isuzu Trooper driver's seat and it looks brand new. Awesome product! Easy to use. I am so delighted with the results of my repairs that I had to write to let you know! I was skeptical before I made my purchase but I figured it was worth the money to give it a try (repair cost was estimated at $1200). 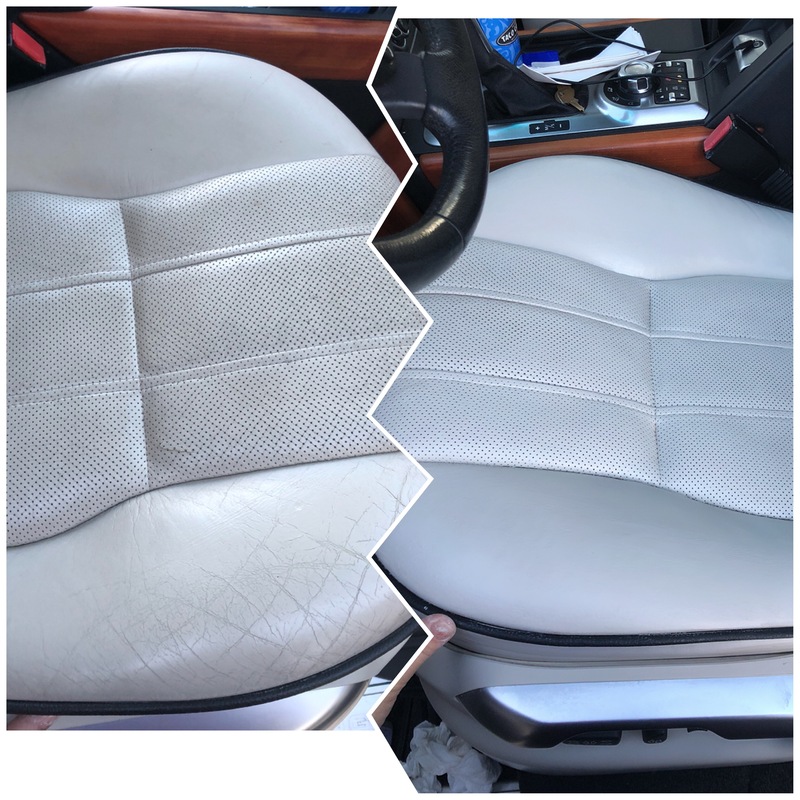 I have a 2001 Lexus Ls430 and some cracking in the front seat which is just usual wear, pigment missing from the door area from just normal use, for a car 10 years old, it was just needing to be freshened up to get it looking better. I not only colored the small cracks in the seat but the passenger seat as well, with just the one kit, I still have lots of color product left since that is all I needed for my car. WOW! My seats look like new, feel new and I dont consider myself to be a fix-it person at all! Your automotive kit is worth it's weight in gold am Im telling every friend I know about it since it just makes you have CAR FEVER about your own car again since it looks just showroom new. Huge smile since I was able to do this myself and easy that ANYONE could do it. I have nice Italian leather couches that our cat scratched up badly. When leather is scratched by a cat, it doesn't leave long claw marks, it creates rough holes with small leather tags sticking out. Very ugly. The repair compound filled in the tears and smoothed down the tags. It blended in so well, you can't tell it was ever scratched! This product also doesn't crack or peel. It's amazing! I ordered Magic Mender to help correct some advanced wear on my Infiniti G35 Coupe. These cars are notorious for having the leather seats show wear on the side bolsters, and after 5 years of ownership, mine were badly in need of repair. I ordered Magic Mender with, admittedly, limited expectations. But after following the directions for preparation and application of the product, I am VERY pleased with the results. The repaired areas look almost showroom condition, and the color match is blended perfectly. I'm very pleased with the product and expect to use it again in the future if needed on my other, passenger seat. Thank you for a great product at a reasonable price! This product is amazing! 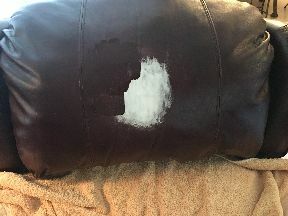 We have brand new cream leather couches that our cat immediately clawed and the small rips and holes showed black underneath. The Color Flex color I ordered was a bit too dark for our particular sofa so I toned it down with the white tint and mixed the perfect color. The repair compound smoothed down the holes and the couch looks back to brand new. Thank you! This is my second order with your company--the product is outstanding and I no longer have a strong desire to kill my cat for what he did to the leather furniture. Thank you and keep up the good work. 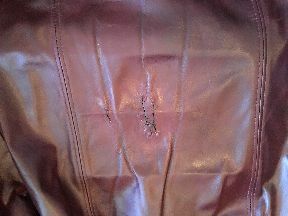 Just wanted to say I repaired a long gouge in the sleeve of my black leather jacket and I can wear it again! Jacket looks great. So now I'm going to see how well I can repair where the pets claws scratched in my cream leather couch. 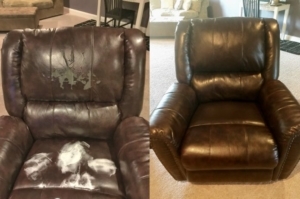 I just wanted to say thanks for making my 10 year old couch look like new, again. The color match was prefect (dark green) and I followed the directions and found the process easy. I cannot express how pleasantly surprised I am! Your product is very simply to use, instructions are very clear, and the final result is outstanding! The leather on my car looks just NEW again! And this is not a new car at all! Seats look great, airbrush worked awesome! Its not very often that I reply after receiving an online order, except that I sell products online as well and you never hear the good feedback. I wish I took a before and after picture. I bought a $6500.00 couch and love seat (black leather) in 2004, my favorite furniture. by 2010 I moved 5 times and they have been scratched several times. I got a big dog (110 pound Husky) and let him sit on the couches, that was his preferred sleeping spot as well. 2 years later he had worn the leather out until it was beige in most spots. I moved these couches to the basement, bought new couches, which I hate. In November I moved again and left the couches in the basement where I was living. The landlord kept saying come get these, and eventually they said I bet they can be fixed. After a bit of Google searching I found you, ordered your product it cost me $75.00 or so and about 7 hours of time. Wow, they are now show room condition.... I am now going to go on Kijiiji to find some worn out couches to re-finish and complete the rest of the rooms in my house. Feel free to add this to your testimonials, its rare that I buy a product online and am so satisfied that I get what is advertised. I owe this review since I am one to deliver a bad review if required. I ordered Color Flex to refinish my 2008 Infiniti EX35 steering wheel. I bought the car used, and the leather was worn, discolored and sticky. It is a light color, so all the imperfections were very obvious as dark spots and loss of luster. I looked up the OEM color using your online tools, followed the instructions, and after 3 light coats, applied about 15 minutes apart, the wheel looks and feels like new. It looked good and was usable after about an hour, but after curing for 24 hours, it looks even better; nearly indistinguishable from the factory leather color and texture. I had no idea this would be so easy. This product delivers exactly what is promised. Thanks for a great experience. I have two cats that decided to start scratching at my bonded leather couch. i needed it to be fixed cause it looked awful. i came across your product, and i wasn't sure if it would work cause my couch was so torn up, but i felt like i had to try it since the other testimonials were really good. it was shipped in a reasonable time frame, and i found it easy to use. my couch looks fantastic now! i have attached a before and after photo. my advice to other people though is it can be a bit time consuming, so be patient with it. also, because you are layering the compound over and over again, make sure it is even, because even with the sanding process, you cant take out ridges if it is uneven. it will show through after you apply the colour layer. Thank you very much for you awesome product! i would definitely recommend this product to anyone who has had the misfortune of animal damage on their leather furniture. 2008 accord with candle damage. looks nice again. thanks for the help. ...here ya go. I AM TOTALLY A BELIEVER!!!!!!!!!!!!!!!!!!!!. Yep, never would have believed that your product could do what it did. This is a 10 year old pontoon boat that has seen it all. The main lounge was faded, ripped in areas and totally trashed by years of 6 foot tall giant fishermen abusing the crap outta a pretty nice boat. Every spring meant hours just cleaning for the season and then storing it for those thrown together weekend trips. it was always half done but as complete as necessary just to get on the water and unfortunately the boat looked it. When I ordered your product ,with your help in choosing the color, I never in a million years would have believed what was about to happen. This "POS" great pontoon fishing boat magically became brand new looking . And I am not kidding. BRAND NEW. If you get out the magnifying glass you can see some of the damage but from 3 feet it looks like it just came off the showroom floor. My $15,000.00 investment is now looking like a 25,000.00 investment. I still can't believe it and I am in shock. It took me 2 full days of hard work but the payback is astounding. I could not be happier. Tomorrow morning I am restoring all the rest of it simply because your product gave it new hope. Gave it a life again and I am proud as a new papa to be able to take this beaten up tub and show it off as a workhorse of a boat that looks like it's a few month old. The only complaint I have is that the bottle was just shy about 2 ounces so I had to water it down to finish.. As for my luck I ran out on the lower portion of the lounge so no one is relay going to see it. I really am in shock and disbelief. My boat is back and looking like a million bucks. My advice to anyone trying to renew is simple and you need to be very explicit in your instructions. GO SLOW; in fact slow is too fast, slow down, it's worth every second of your time. I know cause I did the research. The lounge alone was going for 7 grand new out the door. Your 200.00 plus bucks saved me almost 6800.00 dollars and all it took was elbow grease and time. There is an old carpenters saying that says measure twice and then measure again before you do anything. This applies here also. Plan it out and learn as you go. The scariest part is in the drying; it actually went through 3 different color changers as it died down and each was scarier but just being patient and waiting was worth it. After washing her down I am gonna send you guys a picture because no one is gonna believe this is an 11year old boat. I am thrilled, and ecstatic. and mostly shocked. Thank you guys for a great product and a special thanks to the person who helped me with the color blending help. For the extra 16 bucks for the additional brown and black I was able to dead on match the color of the upholstery and sit back and admire what I never and I mean never would have believed. Knowing that all I have to do is spend a couple hundred a year to keep this boat looking new is more than a miracle. THANK YOU , Thank you and Thank you. When all the pieces are back in and she's been washed up no one is gonna believe this is a 10 plus year old boat. You have my respect and appreciation for a reliable product. I hope it holds up to the sun but if I ever want to sell it I know exactly what to do to get it back in shape. Thanks again a million times over. I want to let you know just how pleased I am with your product. I was reluctant to purchase, based upon the price of the kit...knowing that there are other "kits" out there for much less. But I can honestly tell you that your product is worth every penny. I read the instructions and viewed the tutorial and then I was off and running! The leather bar stool looks great! Much better than I could have hoped for. The barstool leather was brownish-black and was a sling style seat. So, I had to repair both sides. Worked tremendously. If there was one thing I could tell you, it would be that because the sling was not only very worn, but had a 1 inch rip in it, I applied 3 or 4 coats of the white repair compound. Wow, I am a believer and like I said, it was worth every penny! I was very much a skeptic and was convinced that your product would be ineffective, but offer a temporizing repair. I couldn't have been more incorrect. I live in Arizona where the left hand side of the steering wheel on my 2000 Lexus LS 400 was all but destroyed by the sun. I shopped at several leather repair locations, but each place balked at the idea of doing a steering wheel. By chance I happened to come across your web site and thought I would give your product a try. I could not be more impressed at the quality of the color match, the durability of the finish and the professional look of the repair. My steering wheel looks brand new. The finish is soft, pliable and durable. The tears and holes filled completely and easily and simply cannot be seen any longer, even with careful inspection. I would enthusiastically recommend your product to anyone in need of leather repair. I will certainly take 'before and after' pictures on my next project using your product. Absolutely impressive; well done. Thank you. Thought you might like to see my before, during, and after pictures. I found the Magic Mender product and results very impressive. The pictures speak for themselves! One bit of advice that I could share is that you should ALWAYS finish with a spray coat for even blend able coverage. Our furniture is only a few years old and my husband and I couldn't believe how fast it was breaking down. We had purchased this expensive 5 year warranty that was going to cover "everything" according to our salesman. I took the appropriate pictures, filled out the forms, mailed them in and it's not covered. We felt so discouraged until I found your website. I started the process about lunchtime and it only took a few hours and that was just because of drying time. We were so impressed at how it turned out. I had to share the photos with my family and they all wanted to know what I used. I will definitely be a lifetime customer with all the leather couches and car seats. Thank you! I just wanted to tell you how pleased I am with the All-in-1 Repair kit. The beige leather in my 2010 Lexus RX 450h is extremely delicate. The leather was rubbing off & it started look hideous. I decided to give it a try this morning & I'm very pleased. It covered all of the dark spots. I was so pleased with the product that I posted your link to Lexus' Facebook page. I hope this will bring even more exposure to your great product. I was skeptical about doing this repair myself and if a product like this would actually work. But the cost was worth the try. Needless to say, I was impressed with the results! My repair was a result of the daily wear of sitting and my 15 mo old thinking it was a scratching pad. She ended up tearing a large patch off (over 12 inches). This product is easy and effective! My couch and love seat were exposed to the worst conditions ever. First, I had moved and it got horribly scratched and everything imaginable was put on top of it. Secondly, I had tile floor removed (including hardibacker) and drywall work, therefore the furniture was covered with cement dust and drywall dust. Thirdly, my cats had scratched it. I had used this product before, so I knew it capabilities. The pictures show the REMARKABLE results. I bought a new steering wheel for my Jaguar Xj and it was the wrong color with some scoring and wear on the rim. I used Magic Mender Color Flex to re-color the steering wheel and mask the blemishes. By the second coat I was already astounded how well it works and how well it matches the factory color of my car. I cant thank Magic Mender enough for saving me so much money. I'm going to use the rest of the kit on my seats and I cant wait for the results! The new color matched PERFECTLY! Now, on to the next care seat repair. 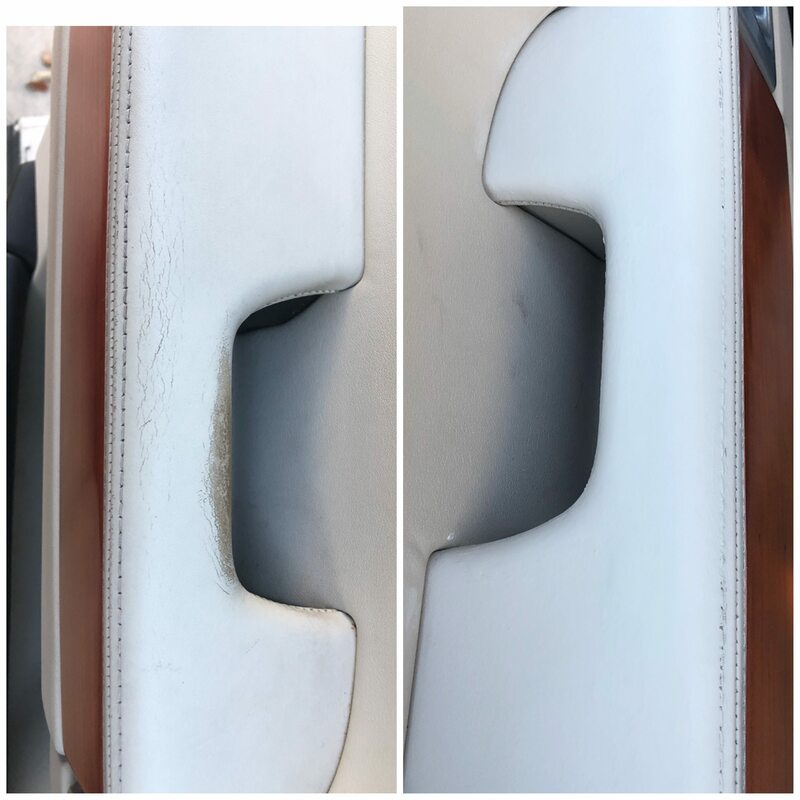 Your repair compound is amazing - I wondered how durable it would be...my car seat leather had torn open...your repair worked beautifully and appears to be very durable. You have an amazing product. I used your Magic Mender with great success on a large ekornes chair. It had four heavily damaged areas. The color was a little off but i was able to color the whole front of the chair and the ottaman. The chair looks beautiful. Thanks for your help. I think it was well worth the money. I had absolutely no faith that your product would work, but I am at the end of my lease and need to turn in my car, so I was desperate! I've had a huge stain in the leather seat for 2 years. YOUR PRODUCT COMPLETELY FIXED IT! It looks like a brand new seat. No trace of stain whatsoever. THANK YOU SO MUCH. I will highly recommend Magic Mender. Its Magic - Ta Da! My car is 23 years old and even with the exact color it wont match because the leather is getting darker. So I wanted my car showroom fresh. It had rips tears, wear, and cracks. Some so bad I may never get them perfect but wow what a difference. For less than .5% of replacement too. I bought enough to do the whole car its perfedt and I didnt even have to take the seats out. I would recommend it though. Finally something that works. I can even add accent colors, I am going to buy some to revive some of my favorite old shoes! I was considering buying new furniture, but I thought that I would give this kit a try after doing some research on the web. Believe me, I priced a comparative replacement set leather couch, sofa, and love seat, and the price was about $4675. My thoughts were, what do I have to loose ... I can try this $59.95 kit and at the least see if its fixable or not. Well I can tell you, this kit really saved me $4675. I thought that it might look a little better, but it was way beyond what I thought my results would be. No exaggeration, it looks better than when it was new! I ordered the 4 swatches and matched the color perfectly before I ordered the kit. So the color is dead on! I just took my time, read the directions over and over, and wasn't scared to sand the rough areas. I've told all my friends. My family is impressed! Thanks so much guys ....You are selling a great quality product! The very patient person in customer support, who helped me with a balky program for ordering and stuck right with me to the end was wonderful, Known to me only as "j", that person deserves a raise. The product itself greatly exceeded my expectations: We had claw gashes sort of everyhwere, and I knew the sofa needed attention. When my husband practically cut the surface in half by dragging the wire side of a mirror across one of the cushions, I knew the jig was up. For once I read every word of the excellent directions, did what they said, and now have almost undetectable marks and huge relief. The color matched almost perfectly even when it was wet; when it dried a shade darker, I was thrilled! I definitely recommend Magic Mender! I was very skeptical, but this product works exactly as advertised. I bought a new couch and right after delivery my cat put a nice scratch across the center of it. The scratch is completely invisible now and shows no trace of repair. Magic Mender saved my brand new couch. I've never given a product testimonial before but there is always a first for everything. 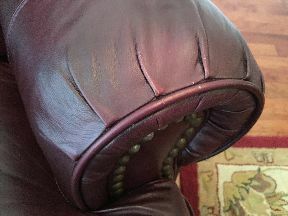 After visiting your website I decided to risk the $60 and shipping on an attempt to repair our 20 year old leather chair. The arm was scratched, worn and even had a 2 inch tear. We followed the instructions carefully and could not be more pleased with the result. The dark blue green was a perfect color match. I'm so glad I took the risk and that the product worked exactly as you advertised. We can enjoy the recliner now for another 20 years. Thanks for a great product. I researched and read lots of reviews on this and other products. My kit was delivered and I read the instructions. My furniture didn't have any holes, however my dogs pads and worn lots of "bald spots" as well as scuff marks. I couldn't find anything on the website that mentions doing a color only repair. So I emailed customer service and waited. After sending another 2, I finally got an answer that I should only use the "paint". The delay in getting a response is why I am only giving 4 stars. Now on to the important part. It Amazing!! I really can't believe how easy it was and that the finished product really makes my sofa and ottoman look like new! Seriously. No ideas why some people say it doesn't work, but I promise it does!! I will recommend this to anyone! Thank you so so much! I purchased this chair at a garage sale recently and honestly just wanted the leather to stop chipping. I didn't mind so much what it looked like because I could always cover it with a blanket. Your product transformed my chair into a brand new one. Seriously. These pictures are before conditioner. I ordered some online and I will apply when it arrives. It is saying my photos are too large to attach. Regardless, thank you again my chair is beautiful thanks to your product! I own a 2010 Lexus GS 350 with a parchment leather interior. 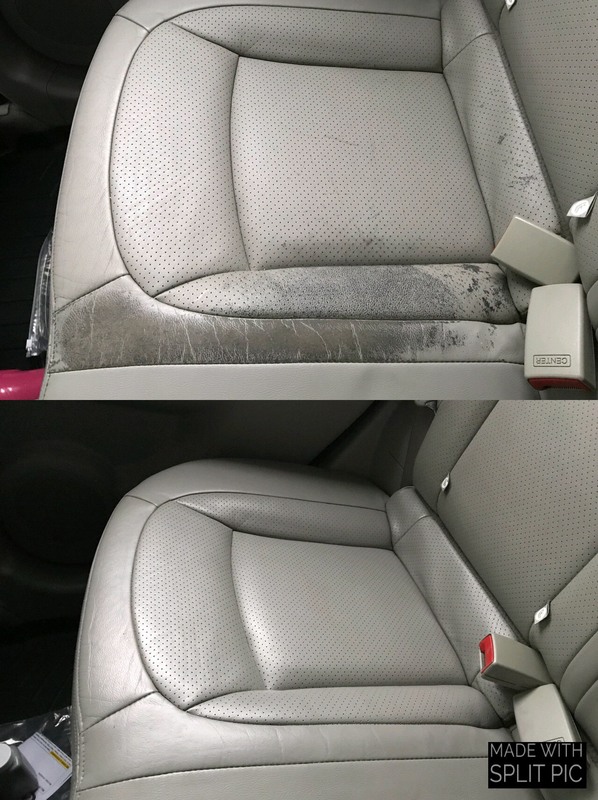 While cleaning a stain from the driver's seat, I used a leather cleaner without testing first and during a vigorous application ended up removing some of the coloring from the seat. I ordered the parchment leather color from Magic Mender (#2134 - Parchment), applied as directed, and I am pleased to say that the color was a perfect match. I didn't think the result would be so good. It really seemed like magic! I have to admit I had my doubts about Magic Mender but I am happy to say I was pleasantly surprised with the results. I can't even tell where my puppy "accidentally" took a bite out of our leather chair. It was very easy to use and the color matched perfectly! Great product. Our beautiful, new living room furniture was just delivered on Saturday from Ethan Allen. By the following Wednesday, one of our three cats had decided that the new leather recliner made a perfect scratching post and she had done so much damage that I was sick to my stomach. The cushion was torn up in all four corners and the armrests had large scratches and visible little holes in them. My husband and I were so upset -- both with the cat and with ourselves for getting leather furniture given our choice of pets. Anyway, in desperation, I did a search on the internet to see if there was any product that could help undo the damage. Like everyone else, I was skeptical about your product, but I figured I had nothing to lose. The chair already looked lousy. What a happy ending! The day your package arrived in the mail, I spent about 45 minutes working on the chair, and Voila! It looks terrific. Okay -- it's not straight-from the-factory perfect, but NOBODY would ever notice that there had been any damage done unless specifically pointed it out to them. It really looks great. I can look at the chair and smile again. By the way, on the same day that I found your product on the internet, I found another product to solve my "kitty" problem. Given that many of your testimonials are from people who have had their furniture ruined by their cats, maybe you'll let me pass along this website. I found a product called "Softpaws" -- sold at www.softpaws.com -- which are little acrylic tips that I've glued onto my cats claws so that they are no longer sharp. My "girls" have now been wearing them for 10 days and they work beautifully! Hopefully, the Softpaws will continue to keep my chair safe, and I now have peace of mind knowing that if they do somehow inflict more damage, I have my magic mender kit to make it all better.